Afraid that you might let go of yourself during an out-door party or picnic? DonÕt be! 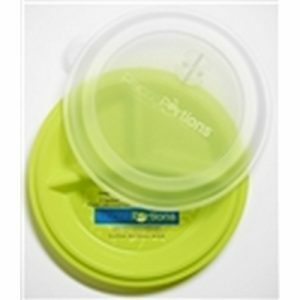 Precise Portions now introduces 100% compostable, dietitian developed, microwave safe portion control plates, cups and bowls that have been especially designed for outdoor use. You can now put food onto our fully microwave safe portion control plates, heat the food and serve your family and guests at an outdoor party. Our all new one-time use portion control plates, cups and bowls are all about providing visual guides to portion control in a very eco-friendly, 100% compostable package. As more and more enlightened Americans opt to control the type and quantity of food they choose to eat, an outdoor get-together or picnic is a great place to display your own encouragement and support to a healthier lifestyle especially if you have diabetic guests at the party. For those actively fighting the battle of the bulge, calorie control is everything. Anything that helps control the amount of food they eat helps in their fight against obesity. One of the best ways to control how much we eat is through the use of visual control methods, such as serving food on smaller plates and paying attention to the type and quantum of food that is put on a plate. What better way to do it than by using our 100% compostable one-time use portion control dinner plates. 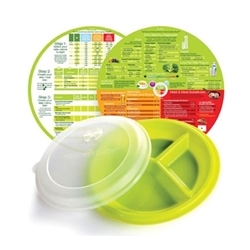 Each portion control compostable dinner plate has elegantly implemented raised icons depicting the food groups for that particular section of the dinner plate. No more guesswork, the presence of these raised food group icons makes it easy to make healthier food choices and the demarcated sections makes it easy to eat the right quantities. Each of our 10- nch nutrition disposable plates is made from earth-friendly recyclable natural fiber that is not only microwave safe, it is also freezer and cut resistant. No more guessing as to type and quantity of food to be served. Our 10 inch dinner plates with their embedded food group icons make portion control so easy that unless done deliberately, it is practically impossible to eat the wrong type of food or to overeat Ð your family and guests will thank you for being so careful about their health as well as being so environmentally friendly. 1 set of ÔEat & LearnÕ System discs that help explain the concept Ð something that will be appreciated by those who are as yet unfamiliar with the concept of portion control. 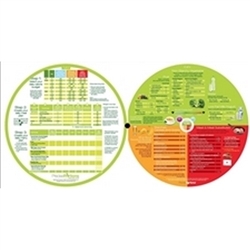 The information on the Eat & Learn System discs is based on proven dietary and nutrition science and a system of improved proportions and optimized caloric intake. The Eat & Learn System discs are absolutely easy to use. Use the Eat & Learn System discs to select your daily calorie budget, next, select a meal plan that falls within the calorie budget and then create your daily menu, absolutely easy.